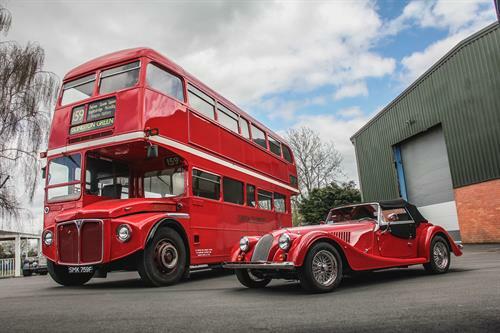 Morgan Motor Company will bring an iconic Routemaster bus – the second-to-last edition to have been withdrawn from service – back to the British public at events throughout 2018. Manufactured, like the first Morgan Plus 8, in 1968 and delivered for its first service in January of that year, this Routemaster - registration SMK 759F - is expected to have clocked over 1.5 million miles during its lifetime. The vehicle was withdrawn from service nearly 44 years after birth and was given an admirable send-off on 9th December 2005. Crowds gathered along the 159 bus route, from Marble Arch to Brixton, as it took its final journey. Morgan Motor Company acquired the bus at the beginning of this year, which is in incredible condition and work is underway to make sympathetic conversions. Preserving its characteristics and many of its original features, the Routemaster will share 50th anniversary celebrations with the Plus 8 and be an accomplice at multiple events for Morgan throughout 2018, showcasing the iconic features of the Morgan brand. Morgan Motor Company is a family owned, British manufacturer of hand-crafted sports cars. Located at their factory in Malvern Link, UK, the world famous Morgan cars offer a unique blend of charisma, quality materials, craftsmanship and performance. Morgan remains the oldest privately owned motor manufacturer in the world – handcrafting coach built traditional British sports cars that are fun to drive and unique within the marketplace. This year Morgan will host its annual Thrill on the Hill event for the first time over two days, day one taking place at the Morgan Factory and day two at the historic Prescott Hill Climb course in Gloucestershire.